The New York Football Giants won Super Bowl XLVI in their trademark fashion: stretching it out and snatching away the last breaths of their fans en route to a heart-stopping win. And we Big Blue loyalists wouldn’t have it any other way. Let fans from other cities enjoy their romps and laughers; we’ll take the cardiac cases. 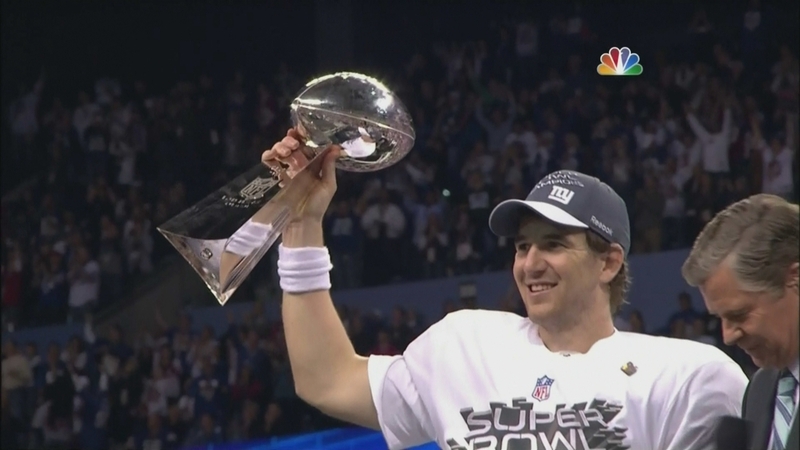 And we’ll take Eli Manning, the king of elite NFL quarterbacks. I have mentioned before what hard work it is being a Giants fan, and that remains true. Even when the Jints win, they make the fans work as hard for it as the team does. I know there wasn’t a Big Blue fan who wasn’t on the edge of his/her seat right until the second that football fell harmlessly to the ground in the end on the last play of the game. I don’t think I had taken a breath since the beginning of the fourth quarter. I think it brings the fans closer to the team, because we voyeurs get to feel like we fought for the win almost as hard as the athlete did. It was a thriller, and it was worth every second. 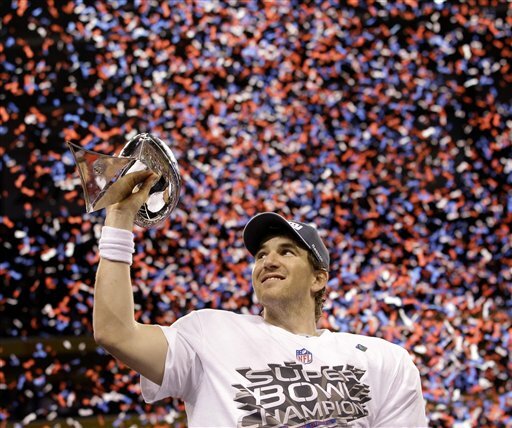 It’s hard to think of any more praise to heap on New York quarterback Eli Manning, who won his second Super Bowl MVP title, tying him with New England QB Tom Brady, and putting him one up on big brother Peyton. Manning went 30 for 40 for 296 yards, one touchdown and no interceptions. He completed his first nine attempts of the game, setting a Super Bowl record, and capped the game with a nine-play, 88-yard touchdown drive that put the Giants ahead for good with just 57 seconds remaining. 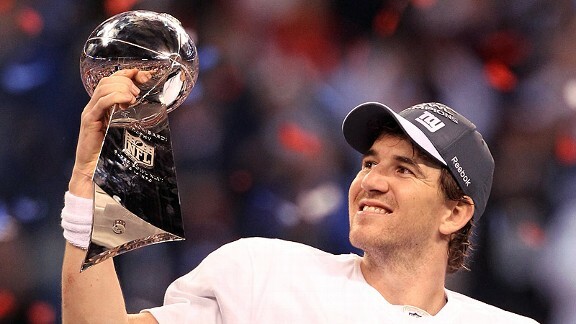 When one thinks of fourth-quarter heroics, one thinks of Eli Manning. You cannot spell elite without E-L-I. Eli has defeated the New England pretty boy, Mr. Gisele Bündchen, twice in two Super Bowls, so that should shut up anyone who thinks Brady has even the slightest edge on Eli. No one else in the league could have delivered that magic missile to wide receiver Mario Manningham late in the fourth quarter – the latest Manning connection to vie for the title of greatest catch in Super Bowl history. (We all have David Tyree’s pinned-against-his-helmet catch from 2008 burned in our memories.) Manningham made an amazing catch along the sidelines, securing the ball and keeping his feet inbounds for a 38-yard gain that changed the complexion of the game. Manning threaded a needle by fitting the ball into an impossibly small window and propelled the team downfield on its winning drive. But then there’s the agony of being a Jints fan. The Giants could have (and perhaps should have) won going away, but once again New York’s nemesis in zebra stripes – the on-field officials – sought to take away by fiat what the Giants had earned. The most egregious case was when Umpire Carl Paganelli called a phantom hold on offensive lineman Kevin Boothe in the first half, negating a Giants first down in Patriots territory and forcing a punt. I’ve seen the replay 20 times, and I still haven’t seen what Boothe allegedly did wrong. I challenge anyone – including Mr. Paganelli – to point out what Boothe did wrong. And then there were the numerous instances in which Patriots defensive backs – especially the handsy Sterling Moore – hit, molested and felt up Giants receivers like it was prom night without being penalized even once. Of course, even breaking the rules couldn’t help the Patsies defensive backs cover the amazingly talented Big Blue receiving corps, but that’s not the point. One might think the officials would be watching the Patriots closely, since the team has a longstanding tradition of… let’s call it stretching the rules beyond the breaking point. But, no. The Patsies still got the benefit of the doubt. I cannot understand why the NFL considers New England its marquee franchise, when the team is so intolerable. The rough-and-tumble, working-class Giants are a much better story than the underachieving Patriots, with their male model quarterback and head coach who, popular mythology has it, may or may not have struck a deal with the devil. BTW, Coach Bill Belichick is now tied for the most losses by a coach in Super Bowl history with four. Couldn’t have happened to a nicer guy. Tomorrow, those actual nice guys, the Giants, will receive the greatest honor New York City can bestow: a parade through the Canyon of Heroes, and a visit to City Hall to receive the key to the city. “Big Blue gave us a game to remember, and on Tuesday, we’re going to give them a parade to remember,” said Mayor Michael Bloomberg. It’s an honor this team has earned through hard work, and one it richly deserves. This entry was posted in Analysis, NFL and tagged Eli Manning, Mario Manningham, postaday2012, Super Bowl MVP, Super Bowl XLVI, Tom Brady. Bookmark the permalink. It’s Super Bowl Sunday for the New York Giants (again)!! Congratulations (says this 49ers fan through gritted teeth). Eli certainly does belong in the elite club now, and in terms of performance under pressure he is twice the quarterback his big brother ever was. It was a fantastic throw to Manningham – and, of course, a fantastic catch. But it was one of several great throws that Eli produced in the clutch. A deserving MVP. Really, this game could have gone either way. If Welker had brought in what (by his high standards) was a very catchable ball on the previous possession. Or if the Patriots had recovered one of their three forced fumbles. Of if Gronkowski was 100%. If, if , if. But the fact is the Pats didn’t convert their ifs. The Giants did. And that’s why they are deserving champions.